For the first time in the cruise industry, an American female took the helm of a mega-ton cruise ship. San Francisco native Captain Kate McCue currently commands Celebrity Equinox – a 122,000-ton, 1041-foot ship in the Celebrity Cruises fleet – sailing year-round to the Caribbean. As Captain, she is responsible for the safe navigation of the ship and the onboard experience for its 2,850 guests and 1,255 crew members. Prior to taking the helm of Celebrity Equinox, Captain McCue also commanded Celebrity Summit and she is scheduled to take command of the transformational Celebrity Edge in late 2019. Known fondly as “Captain Kate” to colleagues, guests and her 70,000+ social media followers, she is a distinguished role-model and frequent spokesperson for Celebrity Cruises, leadership in the maritime industry and encouraging young women to pursue their dreams. 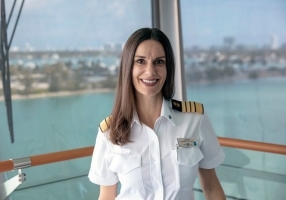 Captain McCue was appointed to Master Captain by Celebrity Cruises President and CEO, Lisa Lutoff-Perlo in 2015 after many successful years working her way through the ranks from bridge cadet to Master Mariner. During her tenure, Captain McCue has managed ship logistics while sailing worldwide itineraries, including Europe, Asia, Australia, the Caribbean, the Pacific Northwest and Alaska, and along the Panama Canal. Captain McCue has also served as a maritime leader while sailing several transatlantic and repositioning cruises and played a notable role in ship revitalization. A graduate of California State University’s California Maritime Academy and has earned ongoing certifications pertaining to leadership, navigation, ship management and security. When not sailing the world, Captain McCue seeks-out adventures with her husband and trusty sidekick cat, Bug Naked.